Tweedsmuir Provincial Park appeals primarily to outdoor recreationists interested in boating, angling, camping, hiking or hunting in one of North America’s most magnificent wilderness areas. Outdoor recreation opportunities are almost unlimited, but those who are not prepared to be completely self-sufficient or who do not wish to employ a professional guide should not contemplate a visit. Park Size: 989,616 hectares for Tweedsmuir Park, 446,092 hectares for the northern part and 15 hectares for Tweedsmuir Corridor Protected Area. Caution should be exercised when travelling on waters in the Nechako Reservoir and those in the park. Windstorms may arise very quickly and become quite severe for multiple days. May is usually the windiest month. Strong winds can be expected for about one-third of the time during the boating season. No attempt should be made to travel long distances or venture far from the shoreline of the reservoir in canoes, kayaks or car-top boats. The Musclow Lake Trail as shown on various park maps is not currently maintained. Suitable clothing must be worn and proper equipment for outdoor living carried. Visitors should have appropriate maps. All arrangements for supplies, including gasoline for boats, must be made before entering the park. At all times, be alert for deadheads, submerged trees and unmarked reefs. As of November 12, 2014: The Pondosy Lake campsite facilities have been removed from the park. Winching services at the Chikamin Bay Rail Portage are open from June 15 to September 7, winching from 7:00 am to 5:00 pm. The northern portion of Tweedsmuir Provincial Park is a wilderness area. Visitors must be prepared to be completely self-sufficient. There are no supplies of any kind. Parts of the park are open to hunting in the fall. Hunters must be in possession of a valid BC hunting licence and appropriate game tags and observe the current BC Hunting Regulations. Non-residents must be accompanied by a licenced BC guide. Firearms are prohibited in the park except during a valid hunting season. Personal cheques and credit cards cannot be accepted. Visitors can pay the Park Operator to tow their boat across at a cost of $50.00 per vessel each way. This service is available daily from June 15 to September 7, 7:00 am to 5:00 pm. The funds are payable directly to the on-site park operator (only cash is accepted). Visitors can use either the hand winches provided on site or bring their personal chainsaw winch to get themselves across the portage. Instructions are posted at Chikamin Bay and the process can take two hours or more. There is no portaging fee for self-portaging but the $50 Marine Access Camping Fee still applies. The fees are used to assist in the management of Tweedsmuir Provincial Park. Tweedsmuir Provincial Park is approximately 480 kilometres by air northwest of Vancouver. 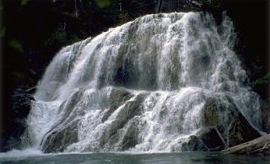 The park is bounded on the north and southwest by the Coast Mountains and on the east by the Nechako Plateau. The park is south of Highway #16, approximately 90 to 100 kilometres, between Burns Lake and Houston. The Nechako Reservoir (Ootsa and Whitesail Lakes) is the main access route to the northern region of the park but boaters must use caution when travelling on these lakes as the shoreline is a forest of drowned trees and floating debris that create hazardous boating conditions. A number of channels have been cut through the dead trees to give access to emergency landing areas. These provide shelter from the sudden and strong winds that funnel down the lakes from the Coast Mountains. See Visitor Information. Two common access points to the northern portion of Tweedsmuir Provincial Park are Little Andrews Bay Provincial Park and Wistaria Provincial Park. See those pages for travel directions. Google Earth KML File of the Nechako Reservoir Pre-Flood, must have Google Earth and/or and Google Maps installed. Eutsuk and Pondosy Lakes are great for boating and sightseeing. Boaters should be wary of unmarked shoals and reefs [PDF]. Canoeing and kayaking are permitted in the park but boaters should use caution. Canoeists should remain near shore at all times as westerly winds can arise quite suddenly, especially in the afternoon. Pondosy Lake is entered by a short, narrow channel at high water. At low water in August and September, it may be necessary to line or pole boats through this waterway. At Chikamin Bay, boaters are required to handwinch their boats over a 600-metre rail portage that connects Chikamin Bay with Eutsuk Lake. The mechanical winching service at Chikamin Bay rail portage begins operating from June 15 to September 7 from 7:00 am to 5:00 pm daily. Winching Service: $50.00 per vessel each way. Quality fishing with good populations of mountain whitefish, rainbow trout, kokanee, and bubot is available in the park. Anyone fishing or angling in British Columbia must have an appropriate licence. Pondosy Bay Resort provides accommodation and guided fishing. Redfern River Lodge provides accommodation and guided fishing. Lakes District Air Services provides air service and accommodations on Tesla Lake. Chikamin Ridge Trail: 3 km long, 600 m of elevation gain. This trail departs from Blackwell Point Campsite and leads to an alpine ridge of Chikamin Mountain. Visitors will be rewarded with spectacular views of Eutsuk Lake and the surrounding mountains. Pay close attention to where the trail emerges into the alpine as it may be hard to find on your return. Surel Lake Trail: 1.5 km, 50 m of elevation gain. A short 300 m trail from Eutsuk Lake leads to a 10 m waterfall on Surel Creek. The trail continues another 1.2 km to Surel Lake where there are scenic views of Surel Peak and Mount Musclow. Musclow Lake Trail: 500 m long, 30 m of elevation gain. This short trail starts at Eutsuk Lake and follows the west side of Musclow Creek to the lake. Views are limited from the end of the trail but it is a good trail for portaging into Musclow Lake. Sand Cabin Bay Lookout Trail: 600m long, 90 m of elevation gain. A short, steep climb from Sand Cabin Bay on Eutsuk Lake to the tip of a rock bluff. Spectacular panoramas of the Nechako Plateau, Quanchus Mountains and the opportunity to view wildlife in the marsh below. Tetachuk River Trail: 5 km long with minimal elevation change. An easy hike from the east end of Eutsuk Lake along the Tetachuck River to fishing spots in the lower Redfern Rapids and a commercial lodge on Tetachuk Lake. Google Earth KMZ File of Eutsuk Lake Trails and Campsites, must have Google Earth and/or and Google Maps installed. Hunting is permitted only during lawful game hunting season. Check the Hunting and Trapping Regulations Synopsis for regulations. There are many wildlife viewing opportunities throughout the park. There is a backcountry cabin available to the public. It is located on Fenton Lake and is used on a first come, first serve basis. Visitors supply their own firewood. To preserve vegetation and ground cover, please don’t gather firewood from the area around your campsite or elsewhere in the park. Dead wood is an important habitat element for many plants and animals and it adds organic matter to the soil. You can conserve firewood and air quality by keeping your campfire small. Limited burning hours or campfire bans may be implemented and some parks may use communal fire rings. Be prepared to bring a portable stove for cooking. The park’s lakes and streams are sources of drinking water. Be aware of the damage caused by spilled fuel, waste water and sewage disposal. Bring your own drinking water as potable water is not available in the park. Lake water is available, however, please boil before using. Wilderness camping areas are located at various sites along the shores of Eutsuk Lake. These areas provide sheltered anchorages, tent sites, pit toilets and fire rings. Please use these designated sites. No reservations are taken.